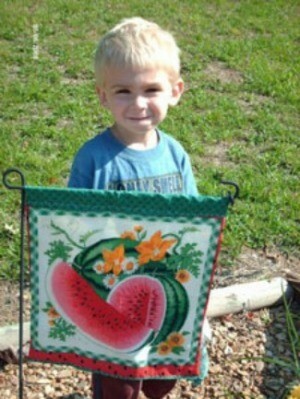 Garden flags are a bright and cheerful garden decoration. You don't have to spend a lot of money to add them to your garden decor; make some inexpensively. This is a guide about making garden flags. Create your own inexpensive outdoor mini garden flags by using fabric pillow panels. Fabric pillow panels are sold by the yard which will give you 4 panels and usually a matching themed boarder which will make 2 mini garden flags. Simply cut out your squares and sew them with right sides together, turn inside out and then add a casing to the top from the boarder that was around your fabric yardage. Leave enough of an opening at the casing's top to slide through your metal garden ground pole. Stitch around the outside 3 edges of your completed flag using a decorative stitch to give both added beauty and stability. This method will give you 2 mini flags with your picture theme on both sides for viewing. If you have matching solid color fabric, just cut squares to the same size as your panel and sew together the same way and this will give 4 mini flags with the backs in solid color to use in areas where you do not mind the back of the flag being visual. Fabric pillow panels are sold in any fabric department and are sold by the yard for $4.00 or even less. They come in all seasonal themes as well as other themes like animals, etc. They are light weight 100% cotton which wash up wonderfully. Simple and fast to create. Create your own one-of-a-kind mini flag for yourself or as gifts and enjoy the compliments you will receive. The 2 panels are sewn together then turned inside out, the border being turned over under the selvage edges and lapped over the top of the open end panel and sewn across the panel horizontally, using a decorative stitch and leaving a 1 inch opening in the casing to slide it through the metal garden poles top. Use whatever decorative stitch your machine offers. 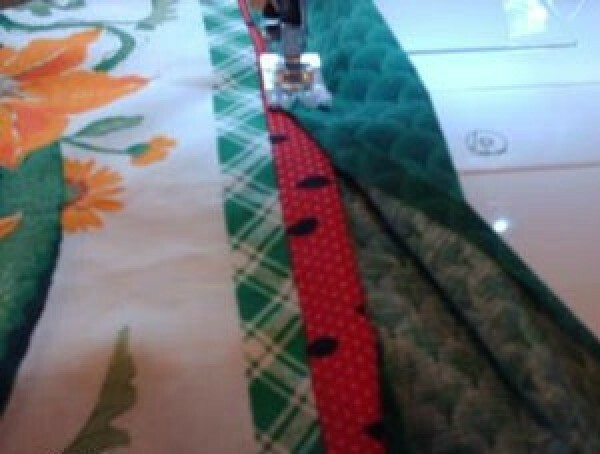 If you do not have a decorative stitch on your machine, a single stitch will work just fine. This watermelon theme was perfect for summer and only cost me $1.00 per yard on sale. Search for theme fabric pillow panels like 4th of July or birthday or your favorite animals like horses, etc. and have fun making them to enjoy! Could anyone tell me if they have ever made those Outdoor Decorative Flags (28 inches x 40 inches)? Is there a kit, or where can you buy them cheap? I am looking for some for the upcoming holidays. Our craft stores don't carry the holiday ones. Any help would be greatly appreciated! I've never made decoratice flags to display, but I have made hundreds of show flags for band competitions. Check your area for a fabric store featuring flag material. My fabric of choice was usually China Silk. It is light and floaty, but you may want to check into a sturdier fabric. Sketch out the pattern you want, or have a picture of one enlarged to the size needed. Cut our the paper pattern, pin it to your material and cut each piece about 3/4 to 1 inch larger than the pattern piece. This allows for a seam large enough to trim for a french seam. Or if the back of the flag will not show, you could alway applique the design on to a flat piece of material cut to the desired size. Remember to add enough extra fablic for hems on three sides and about an extra 3 to 4 inches at the top for a rod pocket.